STAINES-UPON-THAMES, England, March 26, 2019 /PRNewswire/ -- Mallinckrodt plc (NYSE: MNK), a leading specialty pharmaceutical company, today announced the recipient of 2019's Advancing Extracorporeal Photopheresis (ECP) Immunomodulation Investigator Award. The winning entry was submitted by co-investigator Dr. Rachel Crossland of Newcastle University in the United Kingdom. Along with the 2019 Investigator Award, Dr. Crossland's team will receive an educational grant of €50,000 to support their research. 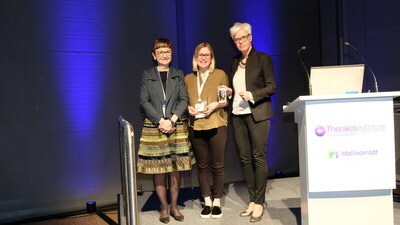 The winner was first revealed at the THERAKOS ECP Immunomodulation™ symposium at the 45th Annual Meeting of the European Society for Blood and Marrow Transplantation (EBMT) in Frankfurt, Germany. On receiving the award, Dr. Crossland said: "We are honoured to receive the Investigator Award and thrilled that it allows us to look at a potential new pathway into how ECP impacts or modulates immune responses in patients." Mallinckrodt developed the Investigator Award to mark 30 years of its pioneering THERAKOS ECP Immunomodulation™. The Investigator Award reflects the company's ongoing commitment to the science of immunomodulation through ECP and its therapeutic applications. Now in its second year, the award recognises individuals and institutions whose research contributes to the advancement of knowledge in this area of medicine. "As a pioneer in ECP immunomodulation, Mallinckrodt is proud to support the work of those who continue to investigate this exciting field of medicine. I congratulate Dr. Crossland and her team, and look forward to seeing the results of their work," said Steven Romano, M.D., Executive Vice President and Chief Scientific Officer of Mallinckrodt.